UNION, N.J., March 12, 2019 /PRNewswire/ -- Bed Bath & Beyond® is pleased to announce the launch of its first-ever private label whole home brand, Bee & Willow™ Home. Designed by Bed Bath & Beyond, Bee & Willow Home is a warm and welcoming collection of well-made home décor, furniture and more, designed to bring charm and character to the home. Bee & Willow Home offers pieces for every room in the home in an eclectic mix of rustic and modern styles. The collection features expertly designed and curated furniture including dining tables and chairs, sofas and side tables to upholstered beds, canopies, and dressers. It also offers a wide range of decorative accents including vintage-inspired rugs, art, pillows, throws and décor accessories. In addition to furniture and décor, customers will find soft washed quilts, throws and pillows as well as simple, quality kitchen accessories like wicker baskets, ceramic dishes, wooden tools, dinnerware and more. The brand features well-designed quality pieces that are crafted in the same manner as high-end furniture brands and pays special attention to detail, durability and style all for an exceptional value. The furniture is adorned with details like thoughtful hardware features, natural wood finishes and spindles. The upholstery pieces utilize washable performance fabrics and slip-covers ideal for every day, flexible living. From a style perspective, the brand introduces new takes on the classic Windsor, Barn-style details, emblematic Wingback forms and an interpretation of Modern Farmhouse. "The inspiration for Bee & Willow Home is a contemporized approach to the idyllic, rustic style of décor. We identified the unique stylistic thread that runs through all farmhouses and cottages from Maine to Key West, the Great Plains to Venice Beach that evokes an honest, restorative and timeless feel," states Barbara Weston, Director of Global Trend at Bed Bath & Beyond. "The materials in the collections include an eclectic blend of rustic, distressed and time loved transitional décor pieces combined with distressed stone, wood and metal. Customers will be able to find quality investment pieces." The introduction of Bee & Willow Home will further serve the mission of Bed Bath & Beyond being experts in the whole home and heartfelt life events by offering a more robust decorative furnishings collection. 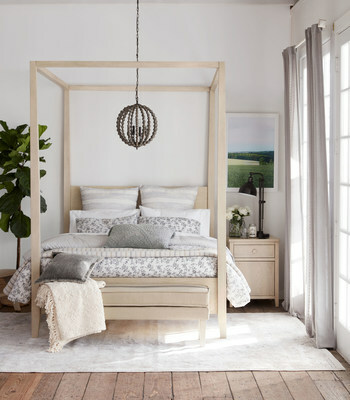 Bee & Willow Home will be the first of six whole home collection launches exclusively made by Bed Bath & Beyond, allowing for the ability to mix and match the different design collections based on the customers individual and unique style. "We are enthusiastic about the launch of our first whole home brand, Bee & Willow Home," states Jean Lindsley, Vice President of Branding of Bed Bath & Beyond. "The Bee & Willow line is the first of six in-house decorative furnishing brands that include furniture that we plan to introduce for Bed Bath & Beyond in 2019 and 2020. We're developing private label proprietary brands to offer a meaningfully differentiated assortment to bring our customers something they're not seeing elsewhere." The Bee & Willow Home collection ranges in price from $4.99 for cleaning supplies to $999.99 for furniture pieces and are eligible for many of our offers and other promotions. Items from the exclusive brand are featured in all Bed Bath & Beyond stores nationwide and online. Furniture vignettes will be in approximately 165 store locations. The entire collection is now available for purchase. To shop, please visit www.bedbathandbeyond.com/beeandwillow.